Anticipate the future. In building custom homes, Eric takes advantage of existing technologies as well as positioning the home to take advantage of future technologies. Q: What does all this wire have to do with us? A: More than we can possibly comprehend. Unless you are in the technology business, and most of us aren't, all this talk about networks, routers and hubs is pretty confusing. Eric is building homes today with the thought of preparing the home to be lived in the way we will live a few years from now. He referred to the mechanical center of the house as the "brain" and he is providing connectivity to his office, the Internet, the phone company, and the security company. 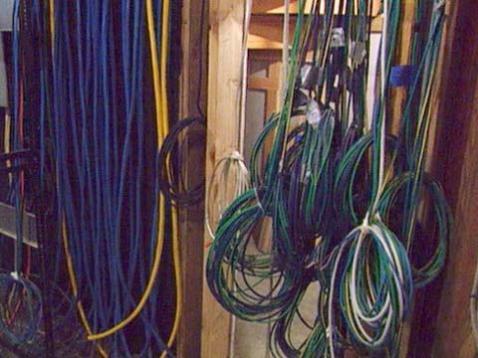 Within the home, servers are move data along thousands of feet of wire so that the owner, from any computer in the world, can lower blinds, heat the swimming pool and warm the water that runs through tubing to melt snow off the driveway. Panels through the homes are programmed to manage light, multimedia, air flow and temperature. We will all live this way, and soon, because this is how information and services will be delivered. Other models will become archaic and cost prohibitive. EM Rose Builders has provided a valuable lesson to all of us: the cost of connectivity is part of the cost of any facility. What can you do for customers that will make their lives easier in the future? HATTIE: How is it that you can make a house so special today, that maybe you couldn't 10 or 15 years ago? ERIC: You know, I think certainly the introduction of technology is the newest, greatest thing that we as a builder bring to the process. But, there isn't any thing that distinguishes the great designers that we work for, from the great designers that lived 500 years ago. It's just talented design. So, this house is as beautiful in its own way as any house you could think of. And we bring to it an understanding of technology, of systems, of performance that will make a great building last long and work well. Every room in this house is a high-tech. The entire house is wired. Every wall, virtually every floor underneath. Each proposed piece of furniture. There are jacks that enable you to connect to the Internet at any time from anywhere. And we're headed towards the first of three mechanical rooms here. HATTIE: (Voiceover) Eric took telecommunications executive, Chris McKay, to the basement of this smart house. ERIC: This is really our -- our brains of the house. On the technology side and on the other side here we have some of the heating and air-conditioning pump stations. And all of the wiring in the house from the third floor down all centers right here. And we have a computer rack that's planned for here. And this is where we interface to both my office, the Internet, the security company, telephone, everything happens from here. CHRIS MCKAY: This house is completely ready to take advantage of whatever technology is out there today, and is really well-positioned for almost any where we can dream it will go in the future. So, first, there's an awful lot of bandwidth, and opportunity for the people inside the house to use it. This wire has five different wires within it that can bring different things into the house. You've got two different telephone wires in here. They're CAT5 wires. What that means is that it's enhanced so that this copper wiring can carry data and be shielded from other interference. In addition, it's got two coaxial cables for delivering cable signals through the house, and this one has a fiber-optic cable as well. The technology that Eric has embraced, has positioned his business for growth and differentiation. ERIC: (Voiceover) Yeah, we've been on a four year track to develop and implement technology and we're now beginning to think about the next generation of what we're going to do to expand on the backbone that we've built. We've made no decision in the infrastructure of the house that would limit a hardware choice ultimately. But we have an IT director in our office and he has the ability remotely to do almost anything in terms of bug fixing, software updates and all kinds of checking and that sort thing. So we have that back up ability as well. This is the wire that will be hooked up to the computer that will run this home being built by E. M. Rose Builders. This idea is a metaphor for thinking ahead and giving your customer service that they will need in the future.